St. Cloud State defenseman NICK JENSEN (14), the homegrown junior from Roger who was selected by the Detroit Red Wings in the fifth round (# 150 overall) of the 2009 NHL Draft, sweeps the puck away from Notre Dame’s imported Austrian right wing PETER SCHNEIDER (15) during the NCAA Midwest Regional Semifinal match watched by the crowd of 2,988 spectators at the Huntington Center in Toledo, Ohio. Three goals inside of a five and a half minute span in the middle of the second period broke open a closely-checked, defensive-oriented struggle as WCHA runners-up ST. CLOUD STATE stormed to a convincing 5-1 triumph over reigning CCHA champion and # 4 ranked NOTRE DAME in the opening round of the 2013 NCAA men’s ice hockey tournament. 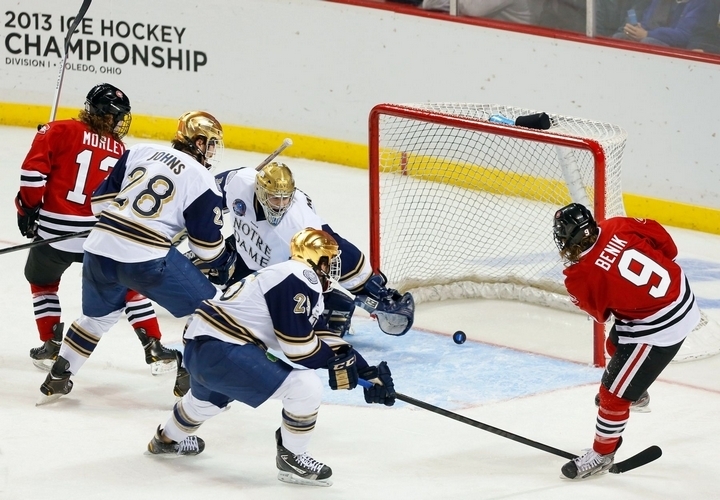 Notre Dame, who have now qualified for the annual NCAA tournament five times in the last seven seasons under head coach JEFF JACKSON and advanced to the Frozen Four on its last appearance in 2011, entered this year’s Midwest Regional Semifinal clash with St. Cloud State in the midst of a nine-game unbeaten streak. 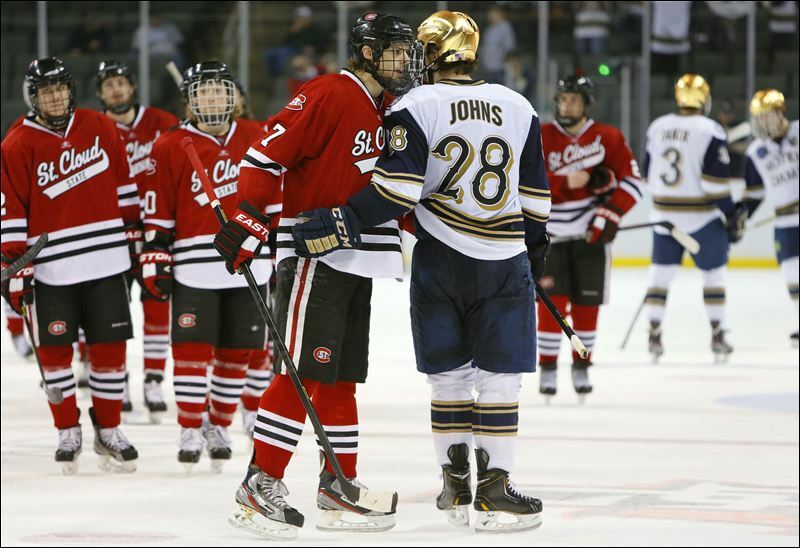 Furthermore, the Fighting Irish featured no fewer than a dozen skaters who have already been drafted by National Hockey League clubs. Meanwhile, the Huskies, who were only promoted from Division II to the elite level of college hockey in the late 1980s, had already qualified for the annual NCAA tournament on eight occasions prior to this season but had done very little as the school’s historical record of one win against eight losses would indicate. Nevertheless, it would be St. Cloud State, who have five skaters that have already been reserved by NHL teams, scored the only goal of what was, relatively-speaking, a wide-open first period that saw the shots-on-target finish 11-10 in favor of the Huskies; left wing BEN HANOWSKI, the homegrown senior from Little Falls who was selected in the third round (# 63 overall) of the 2009 NHL Draft by the Pittsburgh Penguins, cashed in on a rebound at the 11:32 mark and tallied his 17th goal of the season for St. Cloud State. Notre Dame appeared to have tied the game less than half a minute later through its captain ANDERS LEE, the prolific junior from Edina, Minnesota, who led the Fighting Irish with both 20 goals and 38 points this, but the referees correctly disallowed the goal after the video evidence confirmed the New York Islanders’ prospect had kicked the puck into the net. Notre Dame goaltender STEVEN SUMMERHAYS, the undrafted junior from Anchorage, Alaska, who appeared in 36 games (2.01 avg, .919 save pct) for the Fighting Irish this season, has no chance as St. Cloud State left wing JOEY BENIK (9), the 21-year-old freshman who spent the previous two seasons on the other side of the border skating for the Penticton Vees in the British Columbia Hockey League, nets the first of his two goals in the NCAA Midwest Regional Semifinal contest at the Huntington Center in Toledo, Ohio. St. Cloud State doubled its lead on the power play roughly nine and a half minutes into the second period after a shot from the point right to left wing JOEY BENIK, the homegrown freshman from Andover who had scored just three goals in his first 21 games for the Huskies this season. The WCHA representatives from Minnesota struck again a little over four minutes later after Notre Dame turned the puck over behind its own goal line and St. Cloud State center CORY THORSON, the homegrown junior from Crystal, emerged at close range with the little black disc. 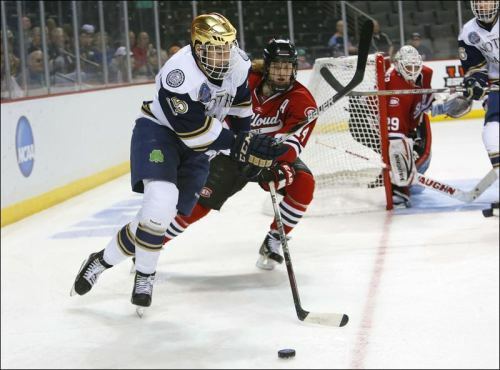 Right wing JONNY BRODZINSKI, the homegrown freshman from Ham Lake, concluded the burst on an odd-man rush and netted his team-leading 22nd goal of the season to leave the Fighting Irish facing a massive 4-0 deficit with just over five minutes to skate in the second period. Jackson attempted to rally his troops and, in a bid to change the sagging fortunes of the Fighting Irish, replaced the starting goaltender Summerhays, who had permitted three goals on only seven shots faced in the second period, with MIKE JOHNSON, the senior from Verona, Wisconsin, who appeared in exactly eight games (2.39 avg, .904 save pct) this season after having made 91 appearances his first three years at Notre Dame, to begin the final frame. Three undisciplined penalties in the first six minutes of the last period made it very difficult for constantly-outmanned Notre Dame, who generated only three shots on target in the entire second period and just five in the final frame, to muster any kind of sustained attack. The Fighting Irish did, however, finally get on the scoreboard after right wing MIKE VORAN netted a shorthanded goal nearing the eight-minute mark of the third period but Notre Dame, who concluded its 2012/13 campaign with a record of 25 victories against 13 defeats with three draws, would come no closer. Yet another penalty to the Fighting Irish, in fact, would enable Benik to collect his second power play goal for unstoppable St. Cloud State. St. 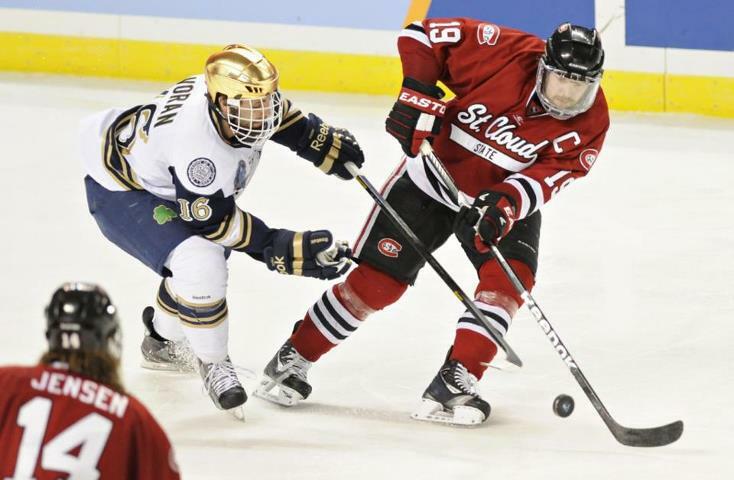 Cloud State captain DREW LEBLANC (19), the homegrown senior from Hermantown who would be selected as one of three finalists for the prestigious Hobey Baker Award this season, passes the puck before Notre Dame right wing MIKE VORAN (16), the undrafted junior from Livonia, Michigan, who totaled five goals and a dozen points in 32 games for the Fighting Irish this term, can intervene during the NCAA Midwest Regional Semifinal contest at the Huntington Center in Toledo, Ohio.